Update: He’s here! Welcome to the world, Leo Arthur. Congrats to the family. Just found out we are having our second boy, our third child. We have a Rose and a Henry. A girl would have been Lucy or Alice. Easy to choose-classic and unexpected I feel. But we are having the worst time coming up with a boy’s name! We want something non-Biblical, which cuts out so many names, particularly Ezra, Jonah, Asa, and Gideon, all of which I love. 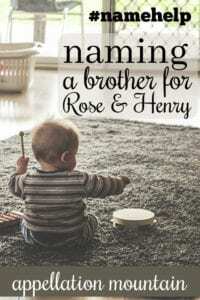 I want a short name because Rose and Henry are short. I want a name that doesn’t stand out as totally different (like Yuri or Idris), but don’t want something that feels super expected or boring (like Jack or George). Somewhere in the middle. Last name is McC- so no hard C sound or Mc- names. There feels like there is no name out there that feels like a natural brother to Henry (which was my favorite boy name ever). Oh and we are due soon – in early December! Congratulations on your third! At first, I thought this would be such an easy question to answer. And then I realized … non-Biblical, not-too weird, not-too popular, short? That rules out nearly every name that came to mind! Let’s start with a question: how serious are you about the non-Biblical part? 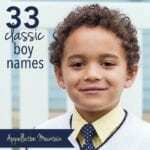 A great many classic boys’ names do have roots in the Bible. But there’s a world of difference between a name like Andrew and something like Jonah. Both could be brothers for Henry, but one makes me think about the Biblical story. The other? I know the name appears in the New Testament, but I don’t put it in the same category as, say, Ezra and Gideon. For now, though, let’s find names that meet all of your criteria. Alex – The average Alex is really Alexander. And a handful of Alexanders answer to some other nickname. But there’s no reason you couldn’t use just Alex. It ranks #151 as an independent given name. There’s Alec, too, which might feel less like a shortened form of a longer name. Or it might just cause confusion. Alex’s roots are ancient and Greek. Clark – Clark brings to mind Superman, but it’s actually a surname with Old English roots, originally an occupational name for a scribe – or clerk. It sounds classic and complete, but not quite as common as Jack. Dean – Like Clark, Dean has occupational origins. Or it might come from a word meaning valley. Either way, it’s not quite as traditional as Henry, but might make a great brother name. Hugh, Hugo – From an old Germanic element meaning spirit or heart, Hugh has plenty of history. But it’s short and complete. I like Hugo even better; it’s the Latinized form of the name. Leo – If the o-ending of Hugo appeals, but it’s not quite the name for you, how about Leo? From the Latin word for lion, it’s fierce in meaning, but gentle in style. Patrick – I know, I know – the nickname Pat belongs to another generation. But Patrick, both syllables, feels handsome and traditional. Theo – Theo shares the same challenge as Alex; most of the time, it’s short for a longer name. And you could use Theodore! But Theo stands alone, too, currently ranked #289 in the US. William – Okay, William ought to be perfect, right? I mean, how great do William and Henry sound together? So great, of course, that they’ve already been used – think Will & Kate and Harry & Meghan. I’m not convinced this is a dealbreaker for everyone. After all, you never call your Henry Harry, right? And Rose isn’t straight off the royal family tree. Still, I wonder if it might feel a little too similar? Overall, I’m tempted to push for Patrick, but is that hard C- sound in your surname too much with Patrick? Or exactly enough? Instead, I’m going to suggest Hugh if you don’t care for -o ending names, and Hugo or Leo if you do. 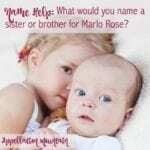 But I can’t wait to hear what readers will suggest, so let’s open it up to the community: What would you name a brother for Rose and Henry? Is he here? What’s his name? Has anybody suggested Thomas yet? Or maybe Colin? I can’t believe I didn’t think of Colin. But it would work perfectly with Henry & Rose! Henry is also my favorite boy’s name, but my husband never went for it. We named our son Emmett. I also love Leon and think it would be perfect for you! Rose, Henry and Leon. And I love Leo for you. Oh, this is exactly my style. Oliver, Elliot, Owen or Bennett. But the best option is really George. Please reconsider! I like the suggestions of Felix, Peter, and Walter. They all sound great with Henry & Rose. I’m surprised no one has suggested Charles…it’s short and not too popular. Though maybe Henry and Charles would be too royal? If so, Edmund would also be classic and unexpected. I really like the suggestions of Dean, Grant, and Lewis. Maybe Heath would be a good choice? Oliver would be perfection! If it’s too popular then I vote for Edward. Ezra always makes me think of Ira–different roots but I think it’s the vowel and ends in a combo. I wonder if you’d like Ira. It’s not super common but easily recognizable due to Ira Glass on NPR. I like Arthur but it may or may not bother you that King Henry VIII’s brother was Arthur (who died young). This is so funny because I have a Rose and then a Henry and then we had a boy. We named him George, which I see that you already ruled out. I guess it depends on where you live as to whether it’s “boring” / common already. It’s pretty uncommon where we live and it does seem like a perfect brother name for Henry. George would have been Lucy, if he’d been a girl. My other favourites are Frederick and Arthur. Our Rose would have been Oscar, but then we didn’t use it for a boy. I also liked Walter and more recently I think Grover is super cool. All these names have an R in them, as do Rose and Henry. Rose, Henry & Walter. “Walt”. When I read the title my first thought was George. I don’t think George is expected I think it is perfect! Another vote for loosening the Bible rule. Rose, Henry, and Gideon doesn’t strike me as Biblical.. even Asa and Ezra feel fine to me when paired with Rose and Henry. (Ezra paired with Noah and Jonah and Ruth would feel biblical, but Rose and Henry? Totally fine.) Of the names the parents listed, Jonah is the only one I’d classify as solidly biblical. I really, really, REALLY like Gilbert here, too. Rose, Henry, Gilbert. Swoon. Patrick is my favorite of the suggestions! 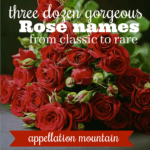 Oh, I LOVE the thought of Henry, Rose, & Gilbert. Perfection. I just want to say regarding the name Patrick: Patrick Henry is a historical figure (give me liberty or give me death). 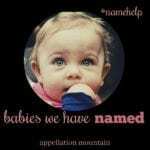 Depending on where you’re located that may or may not be a big deal anyway, and probably everyone wouldn’t put that together; it’s not like they’re not both known names. I love your children’s names! Here are my suggestions, and I do apologize if I’ve included biblical names. Forgive my ignorance! Consider any repeats my ringing endorsements for previous suggestions. We have similar taste (I also have a Rose) and I’d say Arthur or Louis might fit your criteria depending on length. George is also on my list (but doesn’t feel boring to me). My favorite from the suggested list is Patrick. I would suggest Simon! I love the feel with Rose and Henry. Brooks for a boy, Bess for a girl. I’m here to vote for Felix! I also like Oscar and Graham and Dean. I do also really like Peter, which I think is more than a biblical name. I think there’s a difference between “names that appear in the Bible” and “names with strong biblical/religious connections”. Peter and Simon are great brothers for Henry that definitely don’t immeidately make me think Bible. I think Peter Pan and Simon and Garfunkel first. Especially when paired with non religious classics like Henry and Rose. If Peter had siblings named Mary, John, and Gideon, i might notice a theme (but honestly, maybe not even then). That said, my favorite is Graham/Graeme and Pierce to follow the initial rules 🙂 Henry, Rose, and Graham. Excellent point, Jordan P! There’s a big difference between, say, Nehemiah and John. I don’t know which of these are biblical, so sorry, I’m sure some are! Hugo is the first name that popped into my mind. I love the repeated H (as with Henry) and O (as with Rose). Seems to tie your three together. Both names are absolutely gorgeous! My favorites of Abby’s suggestions are Hugh and Dean — both sound lovely with Henry and Rose. The first name that came to mind for me was Simon, although that breaks your non-biblical rule. If Simon is a non-starter, I also like Duncan or Arthur for your sibset. Congratulations and good luck! Henry and Rose are very classy names that are familiar but with a ‘posh’ sound, so I tried to think along those lines without shading into pretentious ;-). * I noticed the shared r, so how about Richard, Robert or Roger? Too boring? * Or play up the British upper class sound with Piers or Jasper or Miles. * If Oscar is too popular, more unusual could be Dale or Niall (I pronounce it ‘nile’ which makes it sound classier than Neil to me!). * Martin is another underused classic, but you might not like the alliteration with your surname. * Speaking of the Mc- surname, you could nod to the Celtic with Stuart or Alan. Hope this gives you some new thoughts! Love Hugo and Leo! If not Jonah, how about Jonas? We have a Jonas in my family. Very special little boy with a wonderful name! Hugo and Theo are great suggestions! Limited it to two syllables but some may be too long for you still.